As early as 1930 he fought as a speaker against Nazism and Hitler's war plans. 1933 Banned from studying and was persecuted by the Nazi state. After military service and captivity, participated in the construction of German democracy and one Europe united by peace and freedom. 1949 Parliamentary Council, which drew up the Constitution of the Federal Republic. Schon 1930 kämpfte er als Redner gegen den Nazismus und Hitlers Kriegspläne. 1933 Studiums-Verbot und Verfolgung durch den NS-Staat. Nach Kriegsdienst und Gefangenschaft Mitwirkung am Aufbau der deutschen Demokratie und eines Europas in Frieden und Freiheit. 1949 Parlamentarischer Rat, der das Grundgesetz der Bundesrepublik schuf. Location. 49° 47.853′ N, 9° 56.29′ E. Marker is in Würzburg, Bavaria. Marker is on Semmelstraße just east of Theaterstraße, on the left when traveling west. Touch for map. 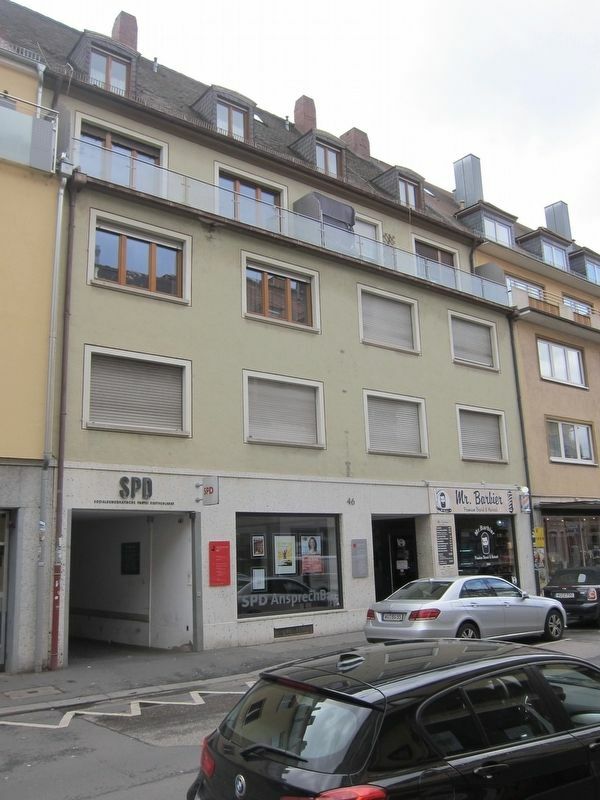 Marker is at or near this postal address: Semmelstraße 46, Würzburg, Bavaria 97070, Germany. Touch for directions. Other nearby markers. At least 8 other markers are within walking distance of this marker. Theodor Drey (here, next to this marker); Helena Petrowna Blavatsky (about 150 meters away, measured in a direct line); Adolf Eugen Fick (about 210 meters away); Altersheim "Hueberspflege" / "Huebers Care" Senior Home (about 240 meters away); Balthasar Neumann (approx. 0.3 kilometers away); Philipp Franz Von Siebold (approx. 0.3 kilometers away); Ehem. Hauger Stiftshof / Former Haug Canon House (approx. 0.3 kilometers away); John Millington Synge, 1871-1909 (approx. 0.3 kilometers away). Touch for a list and map of all markers in Würzburg. More about this marker. 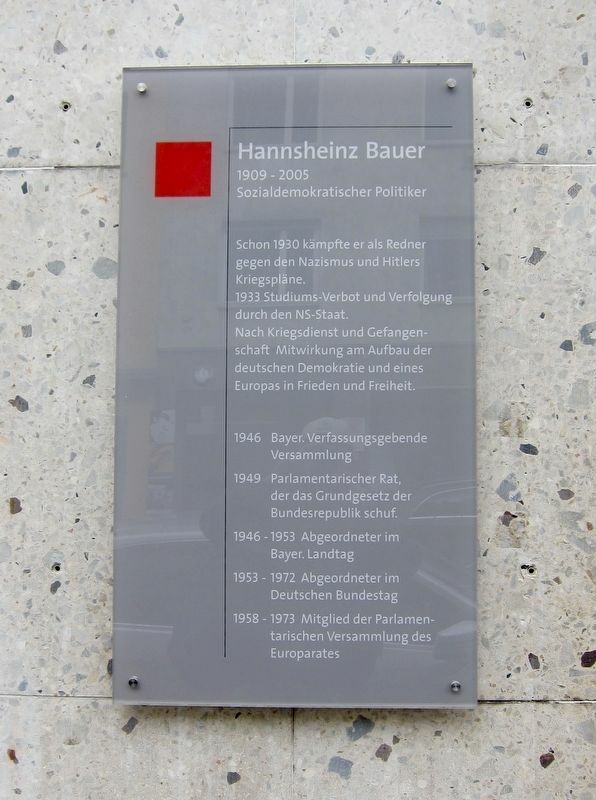 The marker is located on the local Social Democrat Party headquarters. More. Search the internet for Hannsheinz Bauer, 1909 - 2005. Credits. This page was last revised on March 26, 2019. This page originally submitted on March 26, 2019, by Andrew Ruppenstein of Sacramento, California. This page has been viewed 44 times since then. Photos: 1, 2. submitted on March 26, 2019, by Andrew Ruppenstein of Sacramento, California.